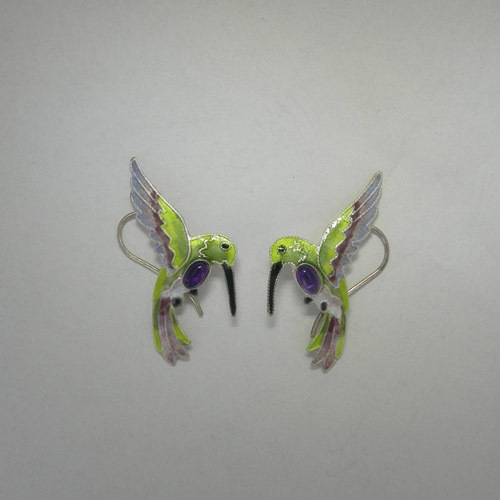 Desc: Sterling Silver enamel Hummingbird Amethyst earrings. The earrings are fashioned to resemble a Hummingbird about to land on a flower. Blues, purple, green and white enamel are used on the Hummingbird. 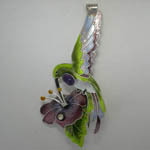 An oval cabochon cut Amethyst is bezel set in the throat of the Hummingbird. The earrings dangle from Sterling Silver French wires. The earrings have a bright polish finish. We have a similar pin/pendant, see SK918.